Fitness Reality offers two “X-Class 710” products. One of them is an indoor cycling bike, the other one is an elliptical trainer. We’ve already addressed the Fitness Reality X-Class 710 Indoor Cycling Bike here, so in this review, we’re going to cover the X-Class 710 elliptical trainer. Also, to eliminate any confusion with regards to the identity of this product, this is the Fitness Reality product part number 2366, while the bike is the part number 2252. The X-Class 710 elliptical trainer is a heavy-duty fitness machine, built of steel tubing. Even though it’s not sold as a commercial trainer (it does not have a commercial warranty), it definitely has a sturdy construction. There are, of course, several parts made of ABS and plastic, but these typically fulfill a protective or cosmetic role, without having an impact on the machine’s overall sturdiness. Some of these are the covers of the crank and belt, and the covers of the arms joints. Its base frame is made of two main parts, the front part with the flywheel and the rear part with the rails. The base is equipped with six adjustable stabilizers with large rubber caps. Therefore, you should be able to perfectly level the machine on any type of floor. On top of that, the unit is fairly heavy; with all the parts assembled, it weighs approx. 154 lbs (69.8 kg), and this weight is also reflected in its overall stability. In terms of size, this elliptical trainer is fairly large. It takes 67″L x 24.5″W (170 x 62 cm), and the frame cannot be folded in any way. Also, Fitness Reality recommends a usage space of 6 square feet to be assigned to this unit for safe operation. But on the other hand, moving the unit once it is assembled isn’t too difficult. Its front base is equipped with two large silicone wheels. One last aspect to mention here regards the machine’s paint finish. All the steel parts are powder coated with a double layer of paint resistant to corrosion and abrasion. The colors used are black for most of the frame bars, black and red for the flywheel. The rails are made of aluminum, and have their own natural polish, while the perimeter of the flywheel is chrome plated. The first and maybe the most important element of this machine’s drive system, is the flywheel. 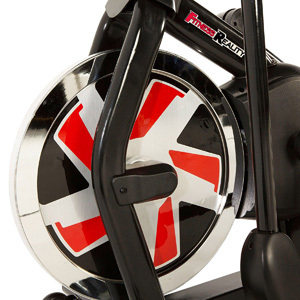 As opposed to many other elliptical trainers with this design, the X-Class 710 features an extra-heavy flywheel, similar to the ones used in spin bikes. The only other elliptical that we’ve reviewed on this site, with a flywheel this heavy, is the Sunny SF-E2310. The machine’s flywheel weighs 44 lbs, and therefore it generates a consistent momentum. It’s perimeter weighted, so it generates a very smooth motion. It’s also bi-directional; the machine gives you the possibility to pedal in reverse, in order to focus different groups of muscles. Like many other fitness machines with a magnetic resistance system, the Fitness Reality X-Class 710 elliptical trainer features a belt drive. This type of drive comes with several advantages. It doesn’t require maintenance, you won’t have to deal with locked links as in case of a chain, it generates less vibration, and it’s almost silent. The pedals are made of heavy-duty ABS material and attached to steel bars. They’re not cushioned, but due to the engineering behind the drive system, the pedaling motion does not produce any shock. As we’ve mentioned above, the rails on which the pedal wheels glide, are made of aluminum. They’re rust-proof and deliver a very steady and silent motion for the wheels. The joints of the pedals bars, as well as the joints between the mobile arms and the console mast, and the wheels integrate top-quality, sealed ball bearings, for a long lifespan and a smooth operation. The machine’s pedals are highly durable. They’re designed to support users up to 300 lbs (136 kg). 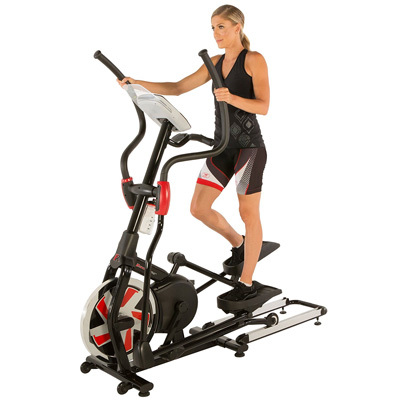 This Fitness Reality elliptical trainer is equipped with two sets of handlebars, one mobile, and one fixed. The mobile arms feature a multi-grip design. The fixed bars are equipped with EKG metallic sensors so that the console can read your pulse through them. Both types of handlebars feature rubberized grips to prevent hand slippage and to provide optimal comfort. Although the elliptical’s drive system reminds of a spin bike due to its large, external flywheel, its resistance system is magnetic. It’s also motorized, which means that the machine integrates a small servo motor that controls the magnetic brake. As you select a certain level of resistance from the console, the servo motor will move the magnetic brake pad closer or farther in relation to the flywheel, creating more or less drag. Needless to say, the machine must be connected to a power circuit for the resistance to become available. The resistance adjustment can only be done from the console. Also, if you decide to exercise by using one of the preset workout programs, the resistance will auto-adjust, depending on the segment of the workout. The X-Class 710 elliptical machine offers 24 levels of resistance. The first levels of resistance deliver a fairly light pedal tension, but due to the weight of the flywheel, the momentum is quite consistent. This being said, it’s recommended to gradually stop the pedaling motion if you decide to pedal in reverse. Conversely, the top resistance settings provide a tough challenge, simulating a steep climb. 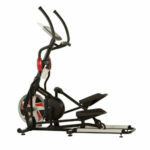 The Fitness Reality X-Class 710 (2366) is a front drive, elliptical trainer. Due to this fact, the elliptical path is slightly inclined forward, not completely horizontal. Due to this fact, the pedaling motion feels like going down a soft ramp. It also results in a more consistent burn for the glutes. Although the machine’s Q-Factor isn’t specified, the pedals are not too far apart. Therefore, your feet are positioned naturally on them, and the pedaling motion doesn’t generate any lateral stress on the joints. 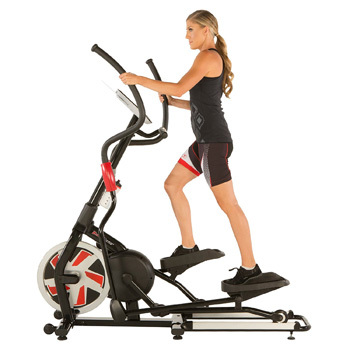 This elliptical trainer offers a stride length of 20″ (51 cm). This being said, it accommodates comfortably users between 5’1″ and 6’4″ (155 – 193 cm). 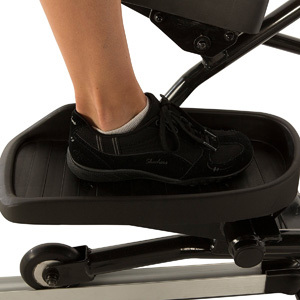 The stride is non-adjustable, and the machine does not have an incline system. Two last aspects to mention here are the pedal step-up height and elevation. At the lowest point, the top of the pedal is approx. 15″ (38 cm) above floor level. The maximum pedal elevation is approx. 21″ (53 cm). These being said, it’s recommended to use the machine in a room with a ceiling that’s at least 25″ (64 cm) higher than you. The control unit covers pretty much every feature that an elliptical machine in this price range should provide. 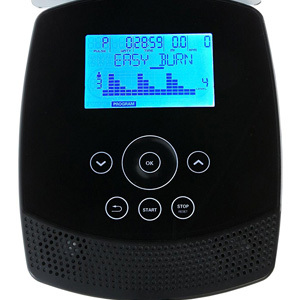 To begin with, it has a 6″ LCD display, with blue LED backlight and large digits, features that considerably improve its readability. It tracks time, distance, RPM, speed, watts, calories, and heart rate. Its mid-section shows the segments of the current program, and the resistance level is also displayed. There are four user settings on the console, a very useful feature if several persons use the machine, or simply if you want to save different workout settings. Each user profile gives you the possibility to input personal data such as gender, height, weight, and age. Based on these, the unit can calculate your calories burned and watts output more accurately. The console is not telemetric; this means it can only read your pulse through the sensors incorporated into the fixed handlebars. It’s not compatible with Polar HR chest straps. Also, in speed and distance can be displayed in either metric or imperial units. The console offers 20 preset workout programs, 1 quick start program, 3 heart rate programs, and 2 custom programs. The Quick Start program allows you to freely adjust the resistance as you pedal. The 20 preset programs provide different workouts; some focus on resistance intervals, others on a long and sustained effort, others alternate climbing with going downhill. The heart rate programs are preset for 65%, 75%, and 85%, while the custom programs give you the possibility to create two programs of your own liking from scratch. The also are goal functions for time, distance, and calories. In other words, you can select a value for these workout metrics and the unit will countdown from it as you exercise, until you reach zero. There’s also a Recovery Test function. One of the best features available with this elliptical trainer is the Bluetooth connectivity. The Bluetooth Smart Technology allows you to sync your trainer with your IOS device in order to directly transfer your workout data into the free MyFitQuest App. This way, you can keep track off your progress, set up fitness goals, etc. In terms of non-fitness features, the console is equipped with a sound system and a tablet holder. The sound system is placed at the bottom of the unit. It’s compatible with most MP3 players or smartphones, and the sound rendered by it is fairly decent. The tablet holder is conveniently placed at the top of the console unit, this way preventing the tablet to block the view of the workout display. The main drive elements of the machine come pre-assembled. However, the rest of the parts do require assembly, and the whole task may take up to two hours. You will basically need to connect the two base parts together, attach the console mast, the mobile arms, the fixed handlebars, the pedal bars, and finally the console. The manual provides excellent, step-by-step guidance for the assembly and all the tools required for the assembly are included. Maintenance requires keeping the rails of the machine clean. You may have to grease the joints from time to time, but if you do this during assembly, they should function flawlessly for a long period of time. Other than this, it’s recommended to periodically check for loose bolts and visibly broken parts. The Fitness Reality X-Class 710 elliptical trainer is a heavy-duty fitness machine, offering 24 levels of automatic magnetic resistance, a smooth and quiet belt drive, an extra-heavy flywheel, and a Bluetooth console with over 26 workout applications. It has a durable construction, being able to withstand riders up to 300 lbs. It’s an excellent machine for light to intense cardio training, intervals, endurance gain, and weight loss, giving you the possibility to focus different groups of muscles and undergo a full-body workout. And finally, it’s not one of the cheapest trainers, but definitely has one of the highest price/quality ratios.